You might have noticed less of a presence from me both on my blog and on social media. Rest assured that just because you aren't seeing me doesn't mean I'm not up to something. I am. I've been up to something for several months now...a sort of inner journey. 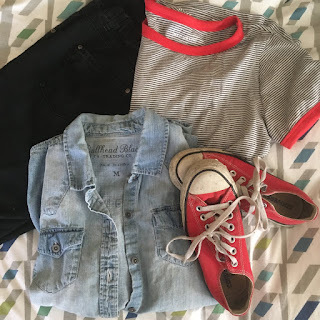 I'm not quite ready to talk about all that, but what I do want to talk about is how this inner journey has effected my outer appearance, namely, the way I dress. If you follow what I'm currently reading, you'll see I'm reading, "The Power of Myth" by Joseph Campbell. All thoughts about Campbell "the man" aside, I feel this book is really valuable for where I am in my life. Something that resonated deeply with me in the book is when Campbell talks about deliberately changing your style of dress when you enter a new phase of life as a means of ritual. *BADA BOOM* It was a mic drop for me. Thank you, Joseph Campbell. You see, black in September I cut bangs again. I love my bangs. They make me feel like myself, and I can't explain why. But they do. When I read that bit about clothing, it really made me think deeply about the way my clothes make me feel, and how I can become more of myself through clothing. Back when I was pregnant, I had a smaller wardrobe because, hello, maternity stuff ain't cheap! But you know what? I loved every piece I had, getting dressed was easy, and most importantly, I felt good in everything I was wearing! My maternity clothes were literally the highlight of my pregnancy. Truth. Since giving birth, I have sort of waffled on style. My pre-pregnancy stuff didn't really fit...I wasn't sure it was my style anymore, anyway, etc. etc. To sum it up: being a mom changes your body, your mind and your life. I was in the style desert wandering aimlessly for the last 4 years. And what I needed was a radical fashion change to help me come into the person I am now. Yes, people, we are talking fashion as a means of transcendence. Standing in my way, first and foremost, was that I have this weird thing about me and the clothing I wear that I will share with you guys: I hate being seen in the same thing twice. I have had this strange belief that if someone sees me in the same outfit twice they will be the impression that I am poor, fashion illiterate, or just a loser. Secondly, I had to ditch all the clothing that was weighing down my closet and my life. And finally, I was lacking a definition of my personal style. 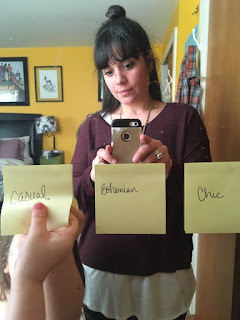 So I had to really hone in on my three fashion "key words." To deal with the fear of being seen in the same outfit, what worked best for me was developing a loose uniform. 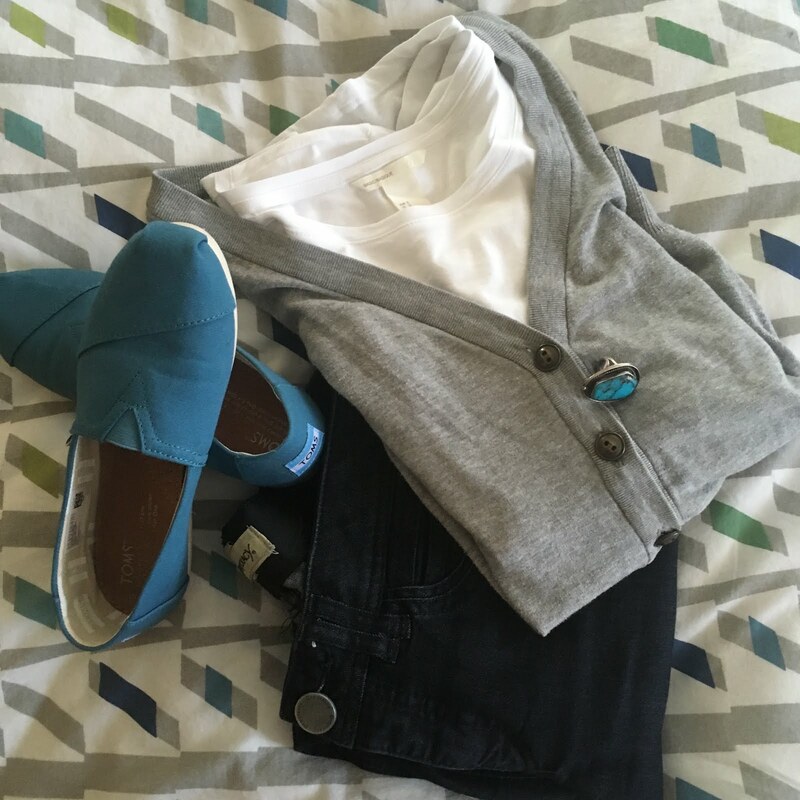 This was easier than you might think because what I long to wear most every day of my life is pretty simple: a white t-shirt and jeans. Once I identified that, it was my paradigm for my uniform. And the premise is pretty simple here in developing a uniform: people are going to see me in the same thing nearly all the time, SO THERE! AND, I'm going to love what I am wearing, feel good, and look good, so I won't care. I would also like to take a beat here to say that after giving it a lot of thought, I realized that 1) people just aren't really paying that much attention to what you are wearing and 2) that my value isn't merely decorative. While I like to look good and feel confident in what I'm wearing, it shouldn't cause me stress and getting dressed was, in fact, causing me a load of mental stress. The next step was decluttering my life of all these clothes. 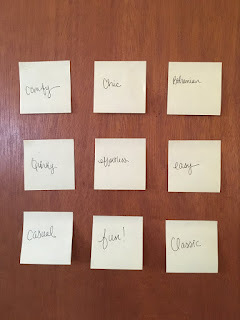 In my searches on Pinterest, I came across two words that really helped me: CAPSULE WARDROBE! 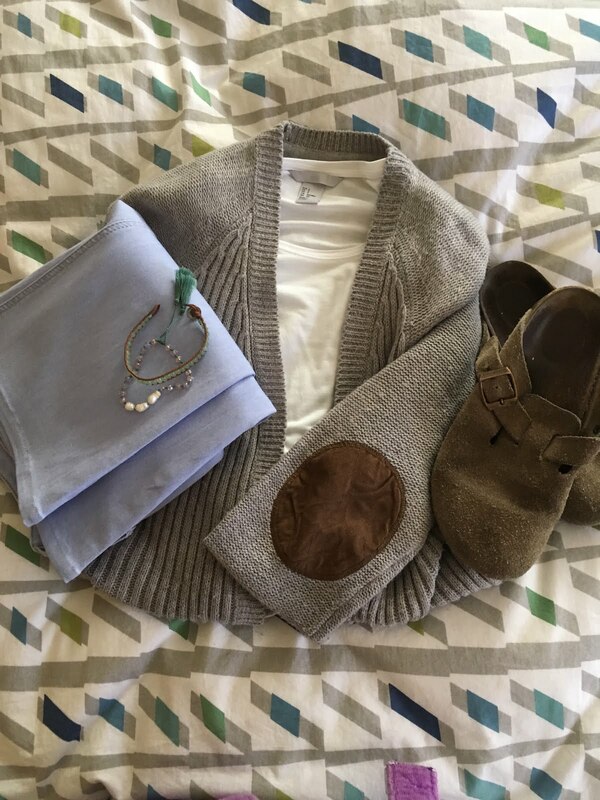 It's basically having a set number of pieces in your closet that you dress from on a seasonal basis. The pieces are meant to be interchangeable, high quality, and ideally, each piece should be something that you would want to wear at least once a week. I love a good template, and this worked for me. 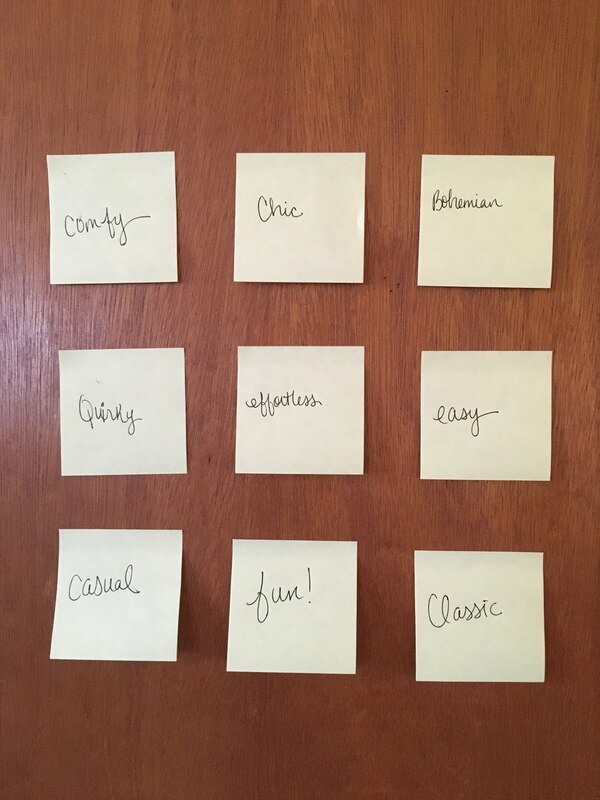 Finally, I looked at all the things in my closet, and after taking inventory of them, I put a set of nine words up on sticky notes and attached them to my closet door. These words were descriptive of what I thought my ideal wardrobe looks like. After sitting with the words, I chose three I thought best fit my personal style and they were: Casual, Chic, and Bohemian. I love a simple, casual style with bohemian touches. Now, I have a closet filled with things I absolutely love. There is room for everything I have and I am continuing to get rid of things that don't fit my lifestyle, don't get worn, or just don't look good on me. I plan on re-doing my capsule wardrobe every three months with the seasons, but still sticking to my basic uniform style as my go-to/signature look. I can dip into my "storage bin" each season, re-clean it, and take things out and in as I please. It's like shopping in my own attic! While some fashion bloggers and experts are super strict about the number of items they keep in their capsule (like 37 items including shoes and accessories) I have been much more flexible with myself. I keep track of what I am wearing by putting a piece of washi tape on the hanger after it's been worn, so I can honestly assess if I'm making use of my clothing. When it is time to go shopping, I have a list of items I'm looking for, for example: red striped shirt, or black pants. I am not randomly finding things in stores that I am merely attracted to that can't be easily interchanged with one another. Most importantly, I feel happier, and lighter, as a result of having less clothing and a more defined style. It takes me no time to get dressed, and I think I look better. I've been getting more compliments on my hair, too, because I am using my extra time to style my bangs or straighten my hair. It's also forced me to take a realistic assessment of my life as it is, in this moment. For instance, why did I have so many formal dresses in my closet when I probably attend 1-2 formal events (if even!) This, for me, has brought a deep sense of security to dressing for my day, and that is the best gift of all!! Lovely content . Thank you for the blog post .